Music recognition service Shazam, which was one of the early App Store hits and has continued to see good success on mobile platforms, is now bringing its services to the desktop in the form of the first music, TV show, and ad recognition app for Mac. Running as a menu bar item, Shazam for Mac quietly monitors audio around the user's Mac and provides not only pop-up notifications of the content being played but also easy access to supplemental content such as lyrics, additional tracks from the album, purchasing options such as the iTunes Store, music videos, social sharing options, and more. Once content has been identified by Shazam, a standard Notification Center pop-up appears onscreen, and an entry for the item is added to the running list of Shazam IDs in the menu bar app. Clicking in either location takes the user to a dedicated page on the web for the identified content. MacRumors spoke with Shazam's Chief Product Officer Daniel Danker about the launch, and Danker highlighted the utility of Shazam for Mac in the context of the popularity of lyrics searches on the Internet. 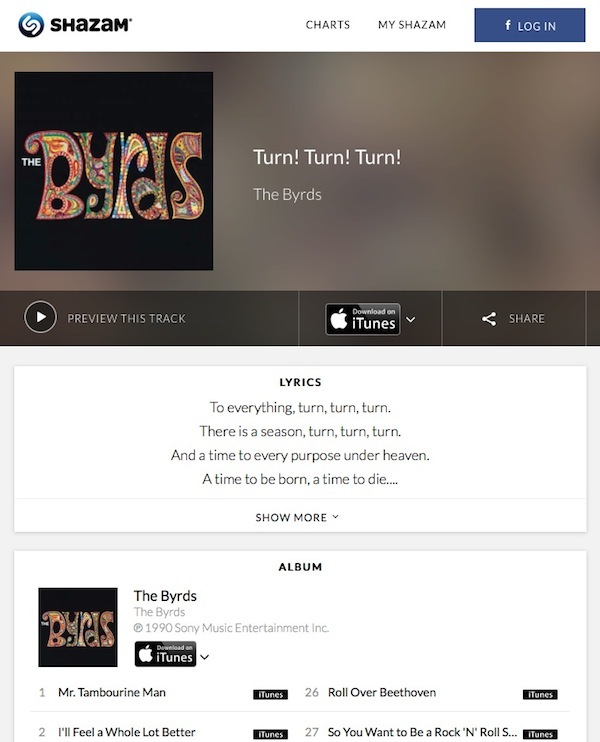 With Shazam's dedicated track pages on the web, Shazam for Mac seamlessly directs users to high-quality lyrics presented in a responsive layout appropriate for various screen sizes and without ads or other distractions. In our testing of Shazam for Mac, the app generally did a solid job of picking up audio and quickly identifying the tracks being played. It is of course limited by the number of tracks available in Shazam's database, and on an eclectic mix of tracks Shazam was unable to identify some of the tracks. Identification was generally solid, however, and came fairly quickly after the track began playing. Beyond music, Shazam also works with television channels in the U.S., and Shazam for Mac was able to identify a number of shows and movies airing on a nearby television. Clicking on the item's listing in Shazam offers quick access to content such as cast information, IMDB and Wikipedia listings, and more. With over 160 U.S. TV channels included in Shazam's database, content can even be identified from the commercials being played between segments. Even ads such as Apple's latest "Stickers" commercial for the MacBook Air can be identified by Shazam. Shazam for Mac marks the next step in the service's evolution as the company seeks to integrate its platform into users' daily technology experience. Its always-on status builds upon the Auto Shazam functionality added to the iOS app late last year. Shazam has also entered into a partnership with Apple that will see Shazam's music identification services integrated with Siri, allowing users to quickly and easily ask Siri to identify the music playing around them. As for the future of Shazam for Mac and the service in general, Danker noted the company is working to build seamless connections with streaming music services to aid listeners, and also enhancing the lyrics experiencing with syncing and other features. 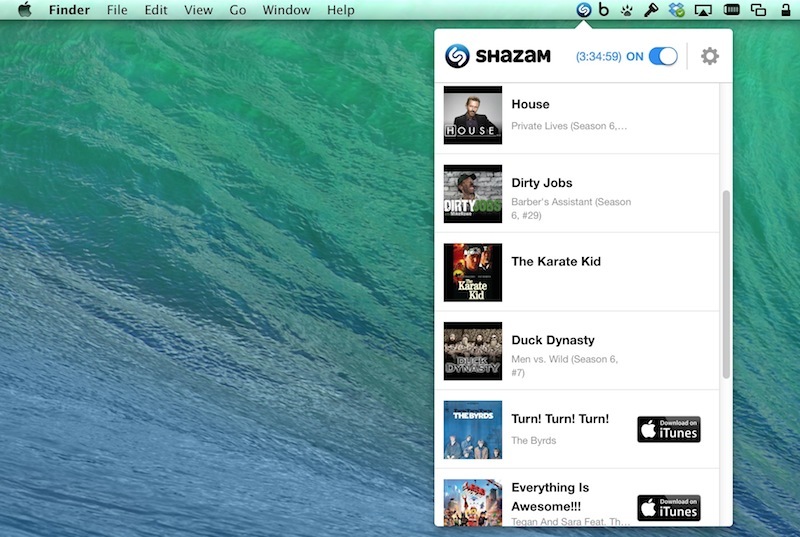 Shazam for Mac [Direct Link] is a free app launching today in the Mac App Store. Is Shazam a front for the NSA? Hmmm... A live mike with a network connection running 24/7 on my desk. What could go wrong? I don't see how as my iMac doesn't have a battery. Or will it gain one by installing this app? That would be neat. - Honey, the dinner is ready! My god people are so self important. Nobody cares about you. You're not THAT important. You're not some millionaire, you don't work in some shady organisation. You're just a geek like us who spends some time on a gadget site and buys stupid stuff on Amazon once in a while. Get over yourself. Nobody wouldn't even want to know what music you are listening to, let alone your whole life. Shazam is the difintion of bloat-ware. Is this article a big advertisement?